For 22 years the Community Cycling Center has helped people of all ages experience the joy of earning their very own bikes. All of the bicycles for our Earn-a-Bike programs are fully cleaned and refurbished by staff and volunteers. It’s a lot of work that requires a lot of support from the community! This year we’re gearing up to get more bikes into our community. We partnered with Helensview High School and Rosemary Anderson to launch a 10-week bike class that teaches students science while working on the bikes they earned. Additionally, we are hosting Bike Clubs at Cesar Chavez and George Middle School where students earn a bike while learning bike safety. Next month, the Community Cycling Center will help 100 children receive a bike at a Bikes for Kids event at Rosewood Initiative in East Portland. And of course, hundreds of children will earn bikes at our largest event of the year in December, the Holiday Bike Drive. When Cyclone Bicycle Supply, a Portland based parts and tool distributor, heard we needed support with building more bikes, they were eager to help. Our biggest need was acquiring more mobile bike repair stands, a super useful tool that volunteers use to securely hold bikes off the ground while being repaired. 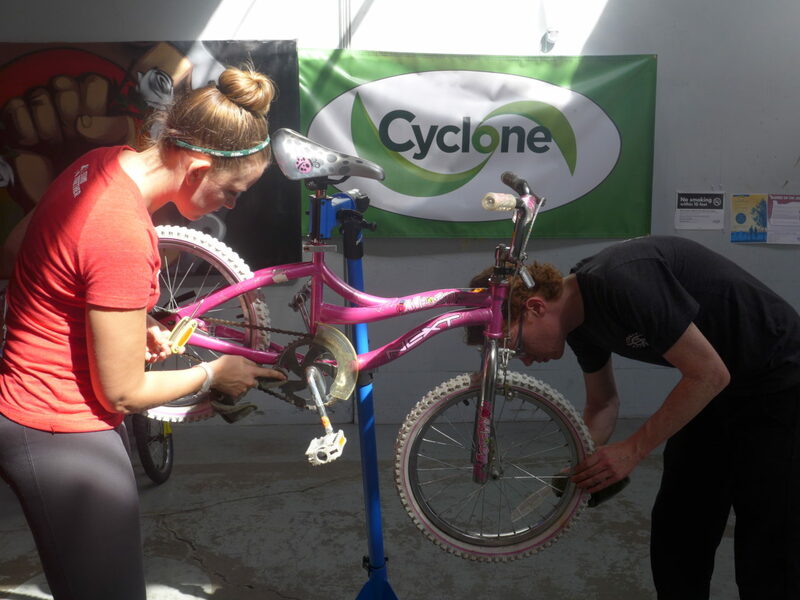 Thanks to Cyclone’s generous support, we now have 35 more bike repair stands to help us clean and refurbish bikes for our year-round Earn-a-Bike programs, bringing our total supply of repair stands up to 50! Why do we need so many? 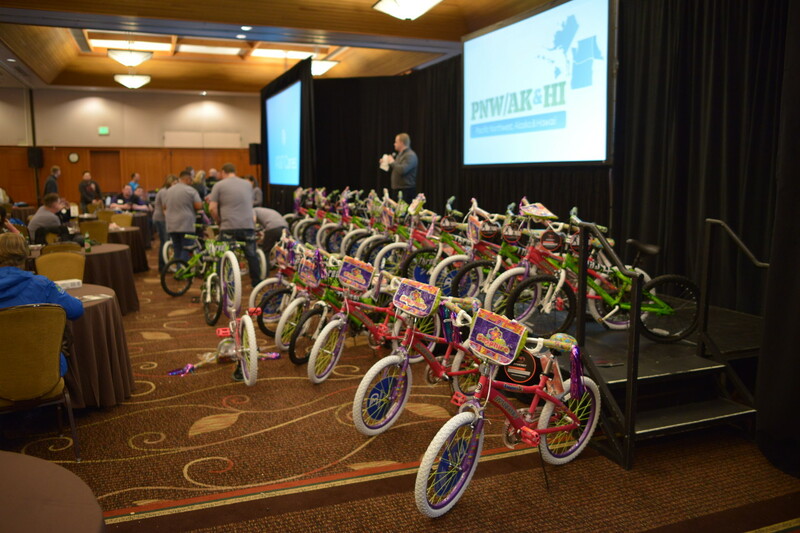 In February Community Cycling Center staff and volunteers traveled to Skamania Lodge to assemble bikes with AT&T Cares’ team of senior leaders and store managers. Thanks to the extra stands from Cyclone, their team of nearly 200 was able to assemble and donate over 40 brand new bikes in one hour. These stands also help us clean hundreds of bikes that are donated to our shop every year. 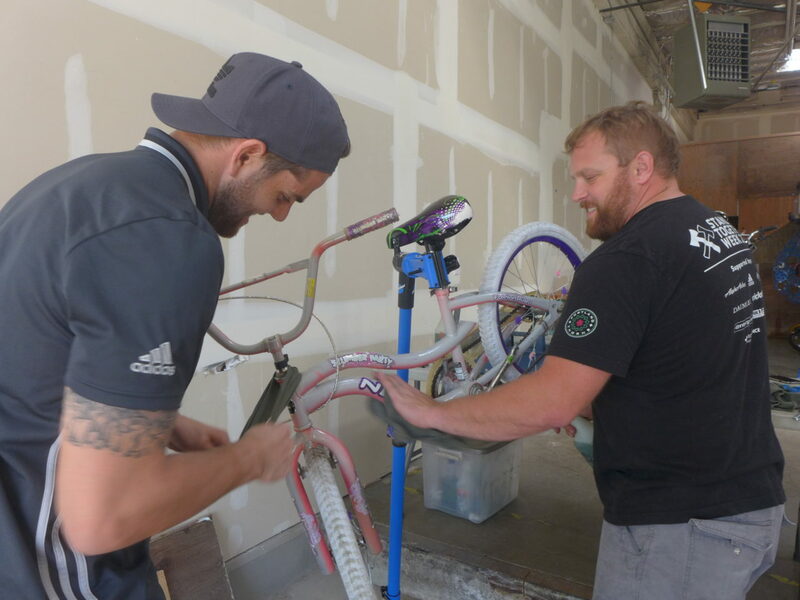 Just last week groups from the Portland Timbers and The Standard used the repair stands to clean dozens of bikes. We’ll host another 15-20 groups this year alone. It’s pretty easy for us to make use of all those stands. Thank you, Cyclone, for your support! We need your help too! If you’d like to volunteer at our Bikes for Kids on May 21st or have us host a volunteer bike-build activity with your coworkers, please send an email to Patrick@CommunityCyclingCenter.org.